The strong magnitude 6.2 earthquake that shook Central Italy around 3:30 this morning (local time) must have revived horrible memories for many people in the Rieti and Abbruzo regions about 100 miles north-northeast of Rome. Seven years ago, a temblor of similar size shook the same area and left the medieval town of L'Aquila in ruins. More than 300 people died in that quake, which has become one of the most infamous temblors in recent Italian history. First reports about today's quake in Italian media put the death toll at about 120. The reports speak of strong shaking and widespread damage. Earthquakes in the central section of the Apennine mountains in Italy. Wednesday's quake (yellow star) in the center is almost masked by aftershocks, less than 24 hours after its occurrence. The two blue stars north and south indicate the epicenters of previous quakes with similar magnitudes. Source: EMSC, Strassbourg. Earthquakes in central Italy are a direct consequence of the complex collision of two tectonic plates. Although geographically a European country, Italy is actually a nail shaped protrusion of the African plate which rams into Europe, creating the Alps far north of this morning's epicenter. This collision has also created the Apennine Mountains. They run along the shaft of the "boot" which Italy resembles when viewed on a map. The Apennines are dominated by a series of north-south trending earthquake faults, which run parallel to the crest of the mountain range through most of central Italy. The epicenters of both the 2009 earthquake and today’s quake lie less than 25 miles apart on those fault lines. 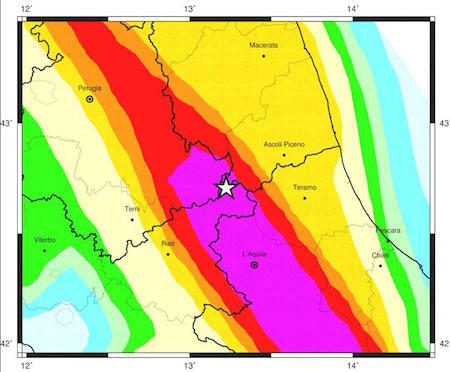 Today's quake occurred near the town of Amatrice to the north-northwest of L'Aquila. Besides the difference in the extent of damage and in the number of lives lost, there are several reasons why the two quakes are hard to compare. While today's quake was followed by several significant aftershocks - one of them reached a magnitude 5.5 - it was not preceded by any noticeable foreshocks. This was different in 2009. In the months before the April 6th quake, the area around L'Aquila was pummeled by hundreds of quakes. Although most of them were small, they were felt by the local population and rattled their nerves. 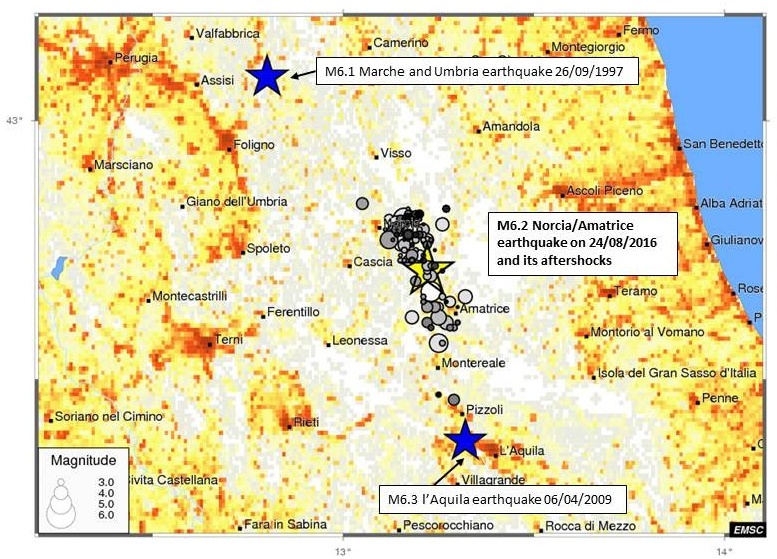 As a consequence, Italy's government established a commission of experts, who were tasked with evaluating the seismic hazard in relation to this earthquake swarm, which seemed to go on and on. While these experts were discussing various scenarios, an engineer without any prior knowledge of seismology stole the show. He had observed that the concentration of radon in some groundwater wells had changed during the swarm. Because he had read somewhere that such a change may be an indicator for an upcoming strong earthquake, he predicted in public that a strong quake was imminent. He did not discuss his findings with any seismologist. The commissioners reacted to this surprise announcement by trying to assure the population that such predictions were nonsense - only to be superseded by reality. A few days after the engineer went public, the devastating quake did indeed happen. Because their reaction was deemed completely inadequate, several commissioners were later found guilty of manslaughter. Before today's quake, however, nobody had attempted a prediction and no commission was in session to gloss over the seismic risk along the fault lines in the Apennines. In fact, this region of Central Italy is considered to have one of the highest seismic risks in the nation.